This equipment is portable to be used off-site, or can be hooked up to CineVic's editing suite which will also need to be booked separately. Please inform us if you will need to book the edit suite along with this device. You will need to provide your own tapes. Capable of recording and playback HDCAM 1080/59.94i, 50i, 25fps, 29.97fps, 23.98fps and 24fps formats. 3-2 pull down is available by using option board HKDW-104. 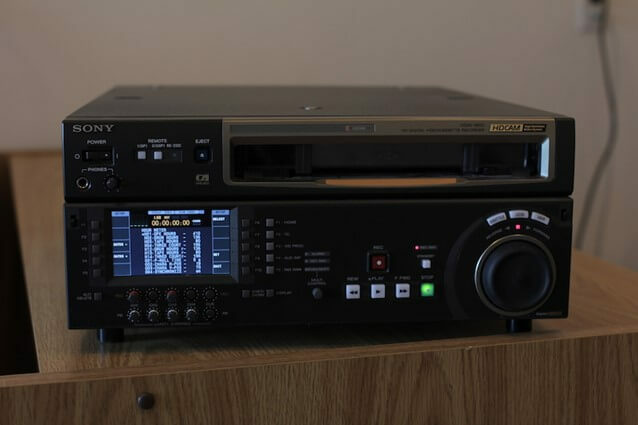 This deck inherited all editing functions from HDW-2000 series, such as DMC, audio split, pre-read and audio cross-fade editing. A color LCD panel on the control panel displays various type of information including audio level meter and time data. The LCD unit also displays video when playback or recording. Built-in down converter enables to output 480/59.94i or 576/50i. Up to 3 packets of VANC metadata can be recorded and played back. Non-audio recording is available such as Dolby-E or AC3. By using HKDW-104 option board, 720/50P or 720/59.94P output is available. The HKDW-105 i.LINK (HDV) input option board can be installed to record the i.LINK (HDV) signals from HDV devices onto HDCAM tapes.